The player window is where the music comes from. 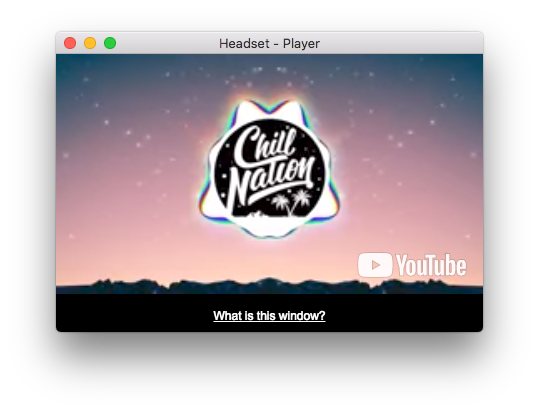 The window loads an embedded youtube player that is fully controlled by the main window and users usually do not need to perform any actions on it. But Why? I don’t want to watch any video! I’m here to listen to music. Headset is, and will always be a music player. There is no intention to make it another video platform. However, due to restrictions in YouTube’s terms of service, Headset is not allowed to hide the video or play it in the background. Infact, the video must be displayed at all times, have a minimum size of 200x200 pxl, and without frames or elements (visible or invisible) on top of it. We are fully aware of this limitation and in order to keep the main user interface small and easy to use, we decided to place the video on a separate window which you can (if you wish) minimize.